(Nanowerk News) What sounds like a dream of the future has already been the subject of research for a few years: simply printing out tissue and organs. Now scientists have further refined the technology and are able to produce various tissue types. The recent organ transplant scandals have only made the problem worse. According to the German Organ Transplantation Foundation (DSO), the number of organ donors in the first half of 2013 has declined more than 18 percent in comparison to the same period the previous year. At the same time, one can assume that the demand in the next years will continuously rise, because we continue to age and field of transplantation medicine is continuously advancing. Many critical illnesses can already be successfully treated today by replacing cells, tissue, or organs. Government, industry, and the research establishment have therefore been working hard for some time to improve methods and procedures for artificially producing tissue. This is how the gap in supply is supposed to be closed. One technology might assume a decisive role in this effort, one that we are all familiar with from the office, and that most of us would certainly not immediately connect with the production of artificial tissue: the inkjet printer. 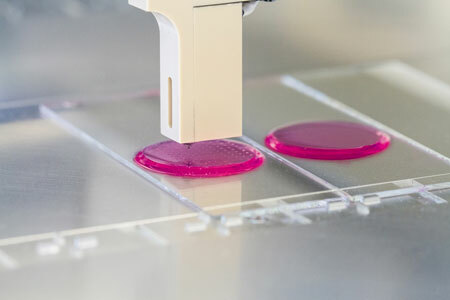 Scientists of the Fraunhofer Institute for Interfacial Engineering and Biotechnology (IGB) in Stuttgart have succeeded in developing suitable bio-inks for this printing technology. The transparent liquids consist of components from the natural tissue matrix and living cells. The substance is based on a well known biological material: gelatin. Gelatin is derived from collagen, the main constituent of native tissue. The researchers have chemically modified the gelling behavior of the gelatin to adapt the biological molecules for printing. Instead of gelling like unmodified gelatin, the bio-inks remain fluid during printing. Only after they are irradiated with UV light, they crosslink and cure to form hydrogels. These are polymers containing a huge amount of water (just like native tissue), but which are stable in aqueous environments and when being warmed up to physiological 37°C. The researchers can control the chemical modification of the biological molecules so that the resulting gels have differing strengths and swelling characteristics. The properties of natural tissue can therefore be imitated – from solid cartilage to soft adipose tissue. In Stuttgart synthetic raw materials are printed as well that can serve as substitutes for the extracellular matrix. For example a system that cures to a hydrogel devoid of by-products, and can be immediately populated with genuine cells. “We are concentrating at the moment on the ‘natural’ variant. That way we remain very close to the original material. Even if the potential for synthetic hydrogels is big, we still need to learn a fair amount about the interactions between the artificial substances and cells or natural tissue. Our biomolecule-based variants provide the cells with a natural environment instead, and therefore can promote the self-organizing behavior of the printed cells to form a functional tissue model,” explains Dr. Kirsten Borchers in describing the approach at IGB. The printers at the labs in Stuttgart have a lot in common with conventional office printers: the ink reservoirs and jets are all the same. The differences are discovered only under close inspection. For example, the heater on the ink container with which the right temperature of the bio-inks is set. The number of jets and tanks is smaller than in the office counterpart as well. “We would like to increase the number of these in cooperation with industry and other Fraunhofer Institutes in order to simultaneously print using various inks with different cells and matrices. This way we can come closer to replicating complex structures and different types of tissue,” says Borchers. The big challenge at the moment is to produce vascularized tissue. This means tissue that has its own system of blood vessels through which the tissue can be provided with nutrients. IGB is working on this jointly with other partners under Project ArtiVasc 3D, supported by the European Union. The core of this project is a technology platform to generate fine blood vessels from synthetic materials and thereby create for the first time artificial skin with its subcutaneous adipose tissue. “This step is very important for printing tissue or entire organs in the future. Only once we are successful in producing tissue that can be nourished through a system of blood vessels can printing larger tissue structures become feasible,” says Borchers in closing. She will be exhibiting the IGB bioinks at Biotechnica in Hanover, 8-10 October 2013 (Hall 9, Booth E09).